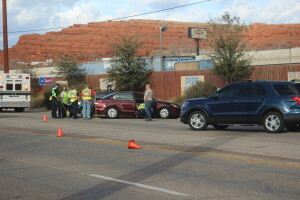 ST. GEORGE — A morning collision on Red Cliffs Drive between the driver of a red Honda Accord and a black Ford Fusion resulted in both vehicles locking together and coming to rest on the opposite side of the street, briefly diverting traffic. 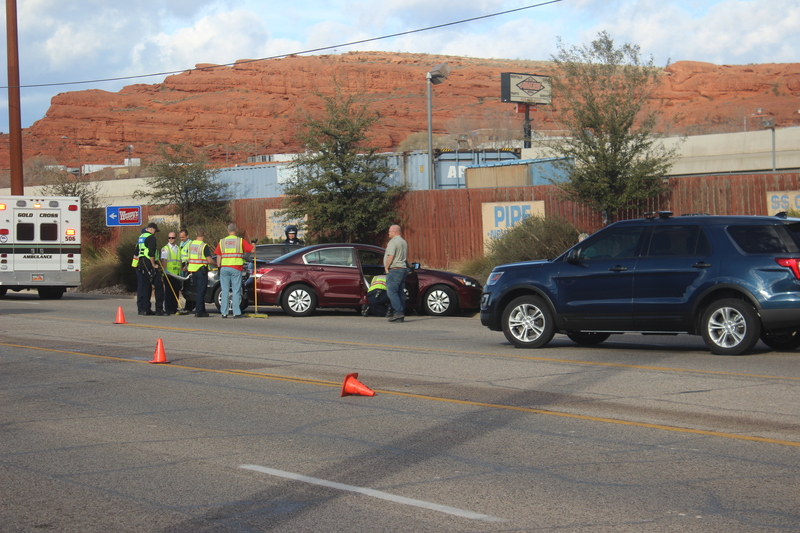 St. George Police Officer Tyrell Bangerter said the driver of the Honda, an adult woman, was pulling out of the parking lot at 2736 E. Red Cliffs Drive and attempting to make a left-hand turn when the driver of the Ford, also an adult woman, collided with her. The driver’s side door of the Honda pinned against the Ford, and as a result, the driver of the Honda had to exit through the passenger door. Both drivers had minor injuries, but neither required medical care. Both vehicles were towed from the scene. The driver of the Honda was cited for failure to yield. St. George Police, St. George Fire Department, Washington City Police and Gold Cross Ambulance all responded to the scene.